The Eames Coffee Table is a low and elongated oval-shaped birch table set on a wire base. Designed by Charles and Ray Eames in 1951, the Eames Elliptical Table is a playful form that is often nicknamed as the ‘surfboard table’ because of its similarities in shape. The Eames Elliptical Table has a low surface height of 10” | 25.4 cm, length of 89” | 226 cm, and width of 29.5” | 75 cm. The tabletop surface is made of a seven-ply birch core with laminate top and backer, and attached to a chrome wire base. What is the Eames Elliptical Table? The Eames Elliptical Table is a low and elongated oval-shaped birch table on a wire base designed by Charles and Ray Eames (1951). 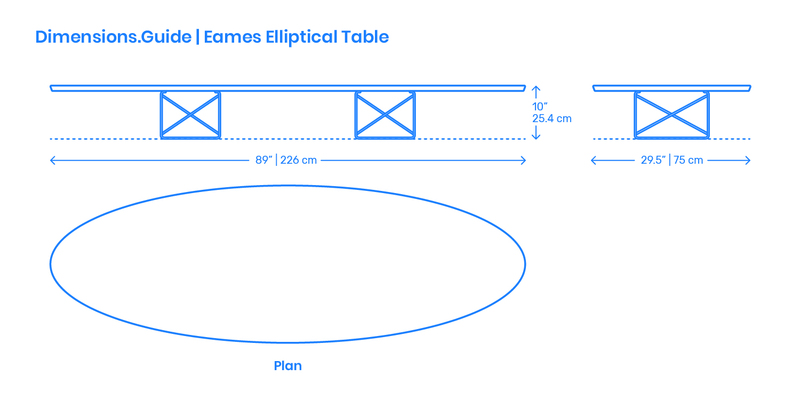 How big is the Eames Elliptical Table? The Eames Elliptical Table has an overall length of 89” | 226 cm, width of 29.5” | 75 cm, and floor area of 14.3 ft2 | 1.3 m2. What height of sofa should be paired with the Eames Elliptical Table? The Eames Elliptical Table has a low height of 10” | 25.4 cm and should be paired with sofas with similarly low seat heights between 10”-12” | 25.4-30.5 cm.